It's never easy to compete at the best of your mental attitude just one week from the ending of the most important even of the season, but that's ski WC and girls and guys had to be ready for their "routine" to start again as after the medals of the World Championships, it was time to battle for the crystal globes once again. A very beautiful day, sunny and very cold temperature were the perfect scenario for the comeback of World Cup to the snows of Meribel after 9 years of absence. The slope was very well prepared and the course funny despite being not very challenging. The early numbers didn't seem to be able to challenge the big names who were to come and so it was until French specialist of speed Marie Marchand-Arvier finished her run with an impressive time and an enormous lead over all the other girls at the moment (she was bib 9). If in the top part where gliding was the main tool to exploit the gaps where always very small, no-one seemed to be able to challenge the time of the French girl from the middle section to the very end, where a perfectly done last turn gave her a terrific speed to finish the race. All the athletes were losing little by little enough to make their time worse than Marie's and even the first girls in the top group weren't able to challenge her. It seemed that the first win in world cup for Marchand-Arvier was set to happen, but Maria Riesch had other ideas in her mind: she started pretty slow and among the girls in the top group she got the worst time in the early sections, but with very smooth moves she painted great lines in the middle steep part and made up all her gap and took a solid lead over Marie and in the end crossed the line just one hundred ahead of her. Best time in the first training Tina Maze as usual suffered the gliding section on top, but bettered the turns of Riesch to try recovering her disadvantage but in the end it wasn't enough as those 8 hundreds relegated her to the temporary 3rd place. Once again race seemed to be over with the girls after the first group being unable to come close to the times of the podium, but bib n°28, Spanish veteran Carolina Ruiz-Castillo immediately made the crowd well-aware that it wasn't over, not yet: in the first two sections she was the fastest and her lead was impressive, fast and accurate Caroline drew great lines in the turns of the middle section and launched the final section with a great speed which was worth of the best time. For the Spanish it was the first victory in World Cup, the second podium after the 2nd place in GS in Sestriere 13 years ago. 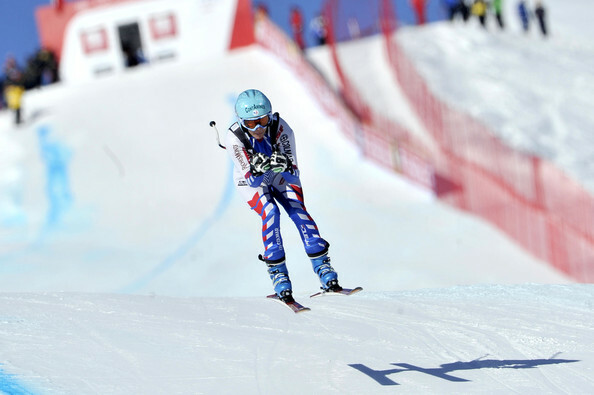 Carolina's win doesn't come as a surprise though as she was very close to the podium few weeks ago in Cortina (4th) and had scored great times in the training. Her joy at the finish area was a great moment for all the fans of skiing as they (and also many other girls of the tour) know the amazing person she is and how much deserved this victory was. Quite immediately after another girl who had made her name big in the trainings got an impressive result as Regina Sterz finished 5th equalling her best result in World Cup. 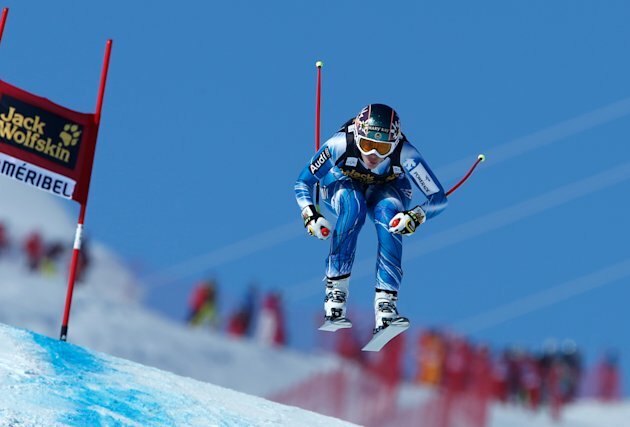 If we do not consider the world championships, this is the 4th downhill of the year where an Italian is jumping on the highest step of the podium after the win of Innerhofer in Beaver Creek and the back to back wins of Paris in Wengen and Kitz, Christof won the historical downhill of Garmisch P.K. even though this year, due to the big snowfall, it was held on a shorter track. Slovenian "specialist" of the so called classic downhills, Slovenian Andrej Sporn, with bib number 2 scored a terrific time, by exploiting his gliding attitude in the very long flat section that followed the start. The Slovenian wasn't very lucky as the course was still "dirty" from some fresh snow, hence not as fast as it later would have been and most of all later a pale sun improved the visibility on the course. Nonetheless his time seemed unbreakable for a very long while and not even Downhill leader Dominik Paris could as he finished just a bunch of hundreds behind him (the two would finish 7th and 8th by the end). First one to stop the Slovenian leadership was Austrian Hannes Reichelt, whose awesome first part was confirmed by a very solid choice of lines in the middle section and all that was worth of the temporary leadership. It didn't last long though, because immediately afterwards it was Innerhofer's moment and the Italian's love for the slope (where he won 3 medals at the world championships just 2 years ago) was enough of a good reason to believe he would have done well and so it was. Despite a couple of mistakes that seemed they could ruin his time, Christof was amazing in the late section where he made almost all the advantage he had at the end over Reichelt. The better visibility didn't prevent Svindal to fall in the traps of the waves of the middle section and those mistakes would cost him the podium as he finished 5th in end, right behind Reichelt. In any case, thanks to this placement he could overtake Paris in the leadership of the discipline. Two Austrians completed the podium behind Innerhofer as Klaus Kroell made a very similar race to the one of the Italian but in the end a bunch of hundreds set him behind him and later (with bib 30) Georg Streitberger scored his first podium in WC in downhill, after the 4 he scored in superg. Very good surprises came from outside the top 30 as German youngester Josef Ferstl made his first top 10 result (9th) with bib 39, just ahead of Johannes Kroell (bib 35), while French guy Muzaton finished 13th with bib 50!